The latest offering from Chopard Manufacture, the L.U.C 8HF model, is definitely bound for the history books as the exceptional timepiece introducing the new L.U.C 01.06-L, the first ever movement with a high-frequency escapement to be chronometer-certified by the COSC. Beating at a frequency of 8 Hz - compared with 4 Hz for ordinary mechanical movements - meaning 57,600 vibrations per hour, this mechanical movement was conceived, developed and perfected by Chopard Technologies in Fleurier. 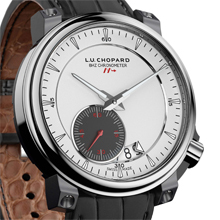 Faithfully pursuing its determination to push the limits of mechanical horology, Chopard unveils the L.U.C 8HF model, an exceptional timepiece housing the first high-frequency (8Hz) escapement to have successfully undergone the rigorous tests conducted by the Swiss Official Chronometer Testing Institute (COSC), a token of excellent precision and reliability. 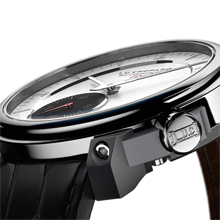 In this respect, it is entirely in line with the tradition of chronometer certification dear to the L.U.C collection. 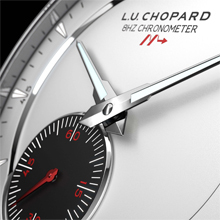 After several years of studies and development, the engineers and watchmakers of Chopard Technologies and the horological research division of the Chopard Group, have succeeded in perfecting a mechanical movement beating at a frequency of 8 Hz, meaning 57,600 vibrations per hour and meeting the most stringent Swiss watchmaking standards. In addition to its COSC certified precision, this L.U.C 01.06-L movement is distinguished by the highly adaptable nature of its high-frequency escapement, since it is indeed compatible with almost all existing L.U.C movements developed by Chopard Manufacture – a major step forwards that further consolidates the coherent nature of the company’s Fine Watchmaking collection. The primary value of high frequency in watchmaking applications lies in a significant improvement in the precision timekeeping properties of a calibre, particularly in terms of rate resumption and stability. A higher number of vibrations of the balance means less sensitivity to disturbances, and Chopard’s technology breakthrough takes on its full meaning when viewed from this angle. For if the choice of high frequency implies enhanced reliability and consequently increased precision, it is quite logical that a product comprising this added value should be duly recognised by an official certification. In addition to ensuring greater reliability, high frequency – which naturally requires more energy – is in this instance associated with a remarkable 60-hour power reserve generated by a single barrel. In terms of materials, the engineers at Chopard Technologies decided to work with silicon for certain escapement components (impulse-pin, lever, escape wheel) and developed a new means of fixing silicon on steel (patent pending). Entirely in keeping with the futuristic movement housed within, the 42 mm-diameter case of the L.U.C 8HF model is made of titanium. It is water resistant to 30 metres and distinguished by its crown at 4 o’clock, also in titanium and bearing the L.U.C logo. The date appears in a pointer-type display at 5.30, while the red small seconds hand at 6 o’clock travels far more smoothly than on ordinary watches thanks to the high-frequency escapement and its 57,600 vibrations per hour. The resolutely avant-garde case features titanium monobloc lugs and caseback with a matt finish. A magnifying glass built into the half-closed case-back is positioned just above the high-frequency escapement, providing a chance to appreciate its finer details. The L.U.C 8HF model is teamed with a hand-sewn matt black alligator leather strap with a cognac-coloured alligator lining, fitted with a titanium pin buckle. It is issued in a first 100-piece limited series equipped with the high-frequency experimental L.U.C 01-06-L movement.